When performance issues arise with an air compressor, the problem can often be traced to heating issues. In fact, an overheating air compressor is one of the most common causes of failure, even with compressors that might otherwise last for many additional years. So what causes the compressor to overheat? An overheating air compressor is the result of internal factors, external conditions, or sometimes both. At certain moments in the system cycle, the air becomes hot as a result of the processes involved, though it swiftly cools before it reaches the endpoint. However, if the air becomes too hot for the compressor to handle, something is indeed wrong with the machine. In a reciprocating air compressor, for example, the air temperature will drop anywhere from 50 degrees Fahrenheit to 75 degrees Fahrenheit across the roughly six inches of travel between the discharge port and discharge line. If the temperature at the discharge port exceeds 300 degrees Fahrenheit, the refrigerant oil and adjacent mechanisms will suffer. For the health of the air compressor, the temperature at the discharge line should never exceed 225 degrees Fahrenheit. Anything hotter at the discharge line would put the discharge port dangerously above the 300 degrees Fahrenheit level. If the temperature exceeds 350 degrees Fahrenheit in the discharge port, the heat could lead to imminent system failure. So how do you prevent an overheating air compressor? We’ve listed a few tips in the sections below to explain how to cool it down. What Causes an Overheating Air Compressor? An overheating air compressor is typically related to factors involving irregular suction or discharge pressure. Alternately, the problem could stem from insufficient ventilation, eroded oil or any given number of issues related to the wear and tear of machine parts. If the metering devices are faulty, your ability to monitor the system with accuracy becomes compromised. To maintain a high value of suction pressure, it’s crucial to check for signs of these issues on a regular basis. To keep discharge pressure levels under control, you should inspect the condensing parts periodically for signs of a problem. Even on larger systems with built-in discharge monitoring, issues can go undetected until the problem spreads to other parts of the compressor. If the air compressor is in a warm area, the machine is liable to have more difficulty adjusting the incoming air to desired levels of coolness. For example, if the machine is in a room with poor ventilation, the heat within that room will affect the internal processes and result in warmer, less efficient air at the end-points of assorted pneumatic operations. The surrounding heat could also lead to the buildup of internal moisture and condensate, which can negatively impact other vital compressor functions. Another concern closely related to the temperature that surrounds an air compressor is the amount of available ventilation. Can the machine sufficiently ventilate or are the vents blocked or cramped? If the placement of the machine is such that the vents are faced directly against a wall, the air compressor should be turned or possibly moved to another area. By extension, if the room where the air compressor is housed lacks sufficient ventilation, the stuffiness and warmth of the interior air could rob the machine of needed coolness. As the components of an air compressor wear down with age, the machine as a whole is forced to work harder to complete its basic functions. For example, if the interior process becomes clogged in vital areas, the air compressor must exert more energy just to get air from the compression chamber and off to the hoses that connect to assorted pneumatic tools. To ensure that the interior components continue to operate efficiently without generating excess heat in the process, have the interior performance evaluated on a periodic basis. Of course, the amount of wear and tear that an air compressor endures is also liable to affect its ability to operate at desired temperatures on an ongoing basis. If the compressor is old and used every day, heating issues could be an inevitable factor in your continued operation of the machine and its various peripheral components. What are temperatures like in your facility? As temperatures increase in various regions, conditions that were ideal for air compressors just twenty years ago could now require some adjustments. If climate trends have rendered summer months far hotter in your area, the time has likely come to boost the air conditioning in the workspace that houses your compressed air system. An issue that closely relates to clogged passages within a compressed air system is the problem of diminished oil quality. More specifically, when the oil gets old and hardens, interior parts are forced to move without sufficient lubrication. The surfaces of metal parts grind against one another and components endure strain as the machine is forced to work extra hard just to perform at its prior level. Old, hardened oil is a primary culprit in the cause of system heat. As parts wear down, you will typically need to replace the oil at more frequent intervals. If the air compressor emits a burnt oil smell, that is a tell-tale sign that the oil has hardened at the expense of the compressor’s cooling abilities. Alternately, heat could cause the oil to lose its viscosity and lead to further problems of this sort. A failing thermal valve can lead to heating issues with an air compressor. It is always best to have a replacement thermal valve on hand in case the preexisting valve on your machine needs to be changed out at any point. 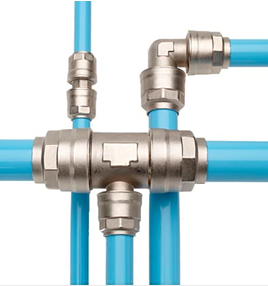 This way, you avoid potential downtime that could occur if a thermal valve fails and you have to wait for a new one to arrive. Furthermore, a new valve can be used for comparison’s sake to see whether the preexisting valve is in a sufficient operating condition. If not, you may have found the source of the heating problem. Certain types of air compressors are suited for more grueling tasks than others. If you are running heavy-duty pneumatic machinery around the clock from one small air compressor, you are liable to run into performance issues that could lead to overheating. Likewise, if the compressor is already more than 20 years old, it could simply be due for a replacement. Consider the size and capacity of your compressed air system in relation to the demands at hand. If you think overheating may be the issue, here a a few signs to look for. If the compressor fails to start up as normal, there is definitely something wrong with the machine that could likely stem from a heating issue. If the compressor requires longer durations between usage cycles, the internal components are probably taking longer to cool down between each cycle. Likewise, if the machine stalls during startup and ultimately takes longer to get into full operational mode, this is probably due to heat-degraded internal mechanisms. In an air compressor, the current flow is regulated by the circuit breaker, which stops the flow when necessary, as a protective measure for the performance and quality of the machine. If the circuit breaker acts irregularly and trips at seemingly random moments, this is a tell-tale sign that bigger problems lurk inside the air compressor. An air compressor could emit noises or smells indicating oil erosion. If you can hear faint creaking noises from the machine that seem out of the ordinary, it could be a matter of insufficiently lubricated internal parts. A more clear-cut indicator of oil trouble is when an air compressor smells of burnt oil. Either way, the issue should be inspected immediately, as insufficient lubrication and poor oil quality can have a domino effect on the internal mechanisms of an air compressor. When an air compressor starts to wear down at an accelerated pace, there is likely a more serious matter at hand. For example, if the machine exhibits performance issues just weeks after it was last serviced, something was probably not evaluated properly, be it a problem with the oil, the vents, the refrigerant or the condenser parts. If the air compressor is long before its time and yet already failing to handle basic demands, there could easily be an issue related to overheating. People often ask about ways to cool down an overheated compressor. A better question, however, is how to prevent overheating from occurring in the first place. The first step toward reversing a heating issue with an air compressor should focus on the internal and surrounding ventilation. Have each vent inspected to ensure they are sufficient for the demands of the machine. If not, you will need to have the vents replaced. Ask your maintenance person what the proper ventilation dimensions are for the size of your system and the operations at hand. Also, consider the external factors of the machine itself. If the machine is in an area that is either too hot or not sufficiently ventilated, arrange space for the machine in a more suitable area. Make sure that this new placement allows plenty of breathing room for each of the vents. As with any motorized machine or vehicle, it is crucial to ensure that the oil in an air compressor is healthy. Check the oil level on a regular basis to ensure that there is enough to handle the demands of your operations. Also, check the viscosity to make sure that the oil has not been rendered too thin or watery — this would be a sign of excess heat within the system. Moreover, check the filters during each oil inspection. Even after you have modified the layout of your workspace to better ventilate the air compressor and the surrounding temperatures, inspect the ventilation and ducting on a regular basis. If dirt or dust accumulate along the vents, clean them out accordingly. Make sure that the ducting flows properly and is not crimped or punctured at any point of the system. Even if, in all practicality, you found no reason to reposition the machine, the vents could still have issues if they don’t receive due attention. An air compressor that cannot properly vent is liable to have heating issues, regardless of where the machine is placed. Over time your needs may change and the air compressor that you purchase one year might not be sufficient in its initial state as the demands of your operations evolve. If your operations have demanded increased amounts of air power since the time that you first bought the machine, consider updating your air compressor with more optimal components. Often, the performance of an air compressor will steadily decline as operational demands progressively increase. This is due to increased demand with no regard for the preexisting capacity of the machine in question. As strain mounts along various points of a compressed air system, so too can heating issues. To prevent this from happening to your compressor, have the machine and its peripherals evaluated by a service specialist and ask for advice on the type of upgrades that could bring the system to full capacity for your current workloads. The moment you realize you’ve got an overheating air compressor, contact a service professional immediately. The longer you wait, the farther the problem will spread throughout your system with even costlier consequences. To get maximum performance from your air compressor, you must have a service provider that you can trust. At Michigan Air, our licensed service specialists can evaluate your machine and determine what’s wrong, either internally or externally, when problems arise. If there are issues with the internal components, we will tell you the problem, whether it involves insufficient oil or damage to one or more parts. Additionally, we will examine the system layout to determine whether the setup or connections need to be changed. With periodic inspections by an air compressor service expert, you can ensure reliable performance from your system year in, year out. If the current demands of your operations are more intense than they were at the time you purchased your air compressor, the machine and its attachments are no doubt working harder now than ever before. With that increased wear and tear comes strain to various parts of the system. Your air compressor could easily work far more efficiently with greater ease if you change out some of the worn, older parts for newer, more optimal ones. Consider, for example, new valves, filters, hoses and fans. With these new parts in place, your compressed air system could easily suction, compress and send cleaner, cooler air to a variety of end tools. When you speak with a service specialist, ask which replacement parts would be of most benefit to your system. Should You Attempt to Repair Yourself? When you run a big operation at a factory, workshop or pressing plant, many details demand your attention. With so many things to oversee on a daily basis, it can be difficult to notice the finer details involving your air compressor and its various functions. Consequently, the system can start to lag at the expense of productivity. Since you own the machine, it might be tempting to handle the maintenance yourself. However, air compressors are complex machines that rely on a number of exact settings, without which operations are rendered inefficient and taxing on the internal components. Even if you follow an instruction manual, your adjustments could be slightly off to the costly detriment of operations. To prevent these issues from arising, you should have a licensed service specialist come and inspect your air compressor and perform any needed maintenance on a periodic basis. Our licensed service technicians come with years of experience in examining and repairing air compressors of all makes and models. When you hire air compressor service people to do what they do best, you can focus on your own operations knowing that your machines are in good hands. When it comes to replacement parts for an air compressor, it is always best to purchase from a reputable seller. With all the time and money at stake on matters concerning your compressed-air system, you should turn to a trusted provider with a lengthy track record of quality parts, machines and service. 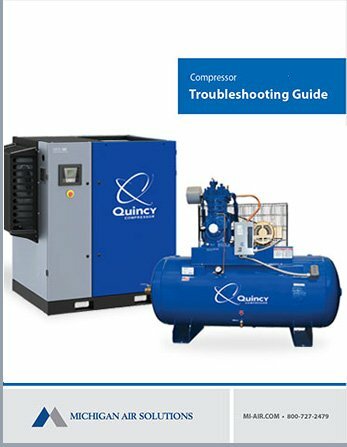 As far as air compressors are concerned, no provider surpasses Quincy Compressor. As the authorized Quincy Air compressor distributor in Michigan, our experts will help you design, troubleshoot and maintain your compressed air systems for maximum productivity, efficiency and longevity. We only recommend and sell the best air compressors, dryers, vacuum pumps and accessories. Whether you need replacement parts to fix an overheating air compressor, or are looking for a newer, more efficient and robust air compressor, Michigan Air has got you covered. Questions? Contact us for more information and advice on maintaining your compressed air system. Michigan Air Solutions is a reliable source for helpful compressor maintenance information. We also offer a wide selection Quincy dryer systems. Our customers are located in Grand Rapids, Detroit, Lansing, and everywhere in between.